Each year, tens of thousands of visitors come to the tiny town of Shipshewana, located deep in the heart of Northern Indiana’s Amish country. The visitors come to see the “simple folk” and experience a taste of Amish life. Sure, the lack of technology and traditional dress of the Amish may lead some visitors to imagine a dull life. But visitors are always amazed at the innovation and ingenuity of the Amish. In fact, nowhere is this more true than in Amish furniture from Brandenberry Amish Furniture. When you visit Shipshewana, make sure you check out the Exciting New Amish Furniture from Brandenberry. Brandenberry Amish Furniture combines the Amish love of simplicity with innovation in a new variety of furnishings. 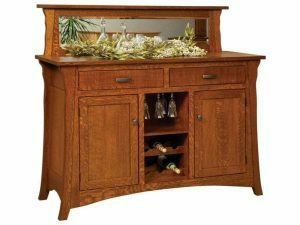 The Francis Buffet blends traditional and modern styles and features dynamic storage (including unique pull-out shelves) and space for wine bottle and glass storage. To see first-hand the wide variety of Brandenberry Amish Furniture, come visit our store location. We’d love to help you find the perfect piece for your home!